Este artículo disponível em Português aquí. 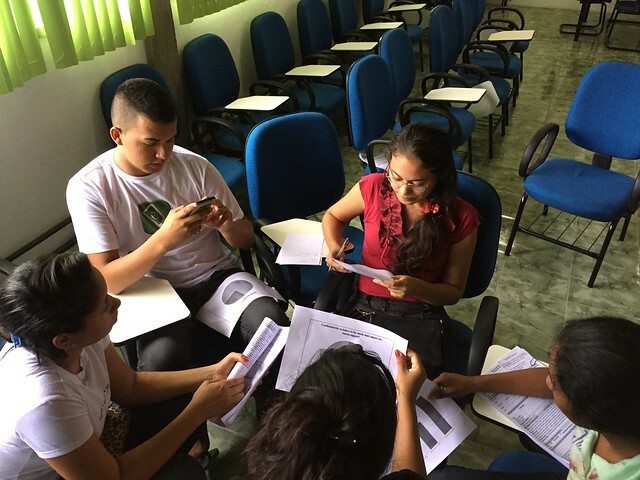 The following post is last in a four-part series on the right to research at PalmasLab, a research and innovation group that is located in, and serves, the community of Conjunto Palmeiras in Fortaleza, Brazil. The first post summarizes the development of PalmasLab’s inaugural research project – a mapping of community wealths, poverties, desires and aspirations. The second post discusses survey implementation, and the third highlights some of the PalmasLab team’s reflections and goals with the project. My experience with PalmasLab challenged me to think about PAR as a process with the potential for building up and strengthening capacity – the capacity to see present circumstances as susceptible to change, to think beyond them, and to imagine something new. Through the research process, the PalmasLab team exercised this capacity, and through discussion, survey implementation, collaborative analysis and reflection, they led others in their community in doing the same. The experience expanded the way I think about the right to research. This right has been described as being critical for allowing individuals to increase their stock of knowledge. It is perhaps even more powerful for increasing a community’s capacity to break out of, or think beyond the constraints, presuppositions and challenges of the present to imagine something different for the future. In this sense, the right to research can also be thought of as the right to imagination. This can be a starting point for change and a powerful political act. Expanding our capacity for imagination is critical in the present moment when many communities feel disconnected from the vision of future progress being painted by those in power. Public dialogue is increasingly divisive, and toxic narratives threaten to shape the way that people think about each other, and about what is possible. In this context, fields that seek to affect social change – like urban planning – must adopt an approach to practice that brings communities together to not only engage in concrete problem-solving, but also to collectively imagine alternatives to the status quo. To work towards a vision of change that resonates with all facets of society, planners should adopt a form of practice that democratizes the process of defining what change should look like. Too often the focus of participatory processes within the field of planning have centered on consultation, or “capacity and knowledge transfer,” as opposed to creating the context for engaging in dialogue and inquiry about the issues communities face and their structural causes. Also, the contributions of marginalized communities in these conventional processes are often seen as solely practical and pragmatic, while longer-term planning for social change remains the purview of “experts” and those in positions of power. This conventional model of participatory planning must be exchanged for a model of knowledge co-creation. Participatory Action Research as a political stance about who has the right to produce credible knowledge, and as an approach that joins together inquiry, reflection and action, has the potential to form the foundation for this new model of practice. Understanding PAR as just an alternative approach to social science research and knowledge production is limiting. PAR values and key principles should be at the center of planning practice, not the margins. For planners, a PAR approach to practice would involve a high degree of flexibility, adaptability and perception. For example, through my participation in the project with PalmasLab, I learned the importance of facilitation techniques in PAR. Facilitation that maintains enough flexibility for community groups to preserve their protagonism in driving the knowledge co-creation process, while also providing a structure and a frame for this knowledge to take shape within, is critical. Taking a PAR approach to practice also calls for an acknowledgment that fields that seek to affect social change are political by nature; planners must learn how to reflectively and critically approach practice accordingly. In my experience as a student of planning, too often skills such as reflective practice and facilitation are marginalized and discounted in favor of “hard skills” that are marketable and more easily quantifiable. This kind of pedagogy often produces practitioners that think they know the solutions before actually understanding the issues, perpetuating a cycle that is often oppressive and unproductive in affecting lasting change. To break out of this cycle we must first develop the critical ability to recognize the way it confines us in the first place. Only then can we embark on a planning approach that centers on the knowledge of those closest to the problems. Post by Jenna Harvey. Photo by Jenna Harvey & PalmasLab.